If you're in the market for the best Samsung phone then we're here to help you tell the differences between them – here we're going to explain the what are the top picks from all the best Samsung phones you can currently buy in 2019. Almost 1 in 5 phones sold worldwide is a Samsung one – that's almost as good as Apple's figures and way ahead of anyone else in the market besides the big two. And it's no surprise: Samsung's phones are well built, powerful, and stylish. With so many to pick from though, how do you decide which ones are right for you? And should you buy now or hold on for what's coming later in the year? Here we'll talk you through all of your options, so you can buy with confidence. If you want the very best phone that Samsung has to offer at the moment then we reckon the Samsung Galaxy S10 Plus is it – with stunning build quality, a superb 6.4-inch display, a battery that's bigger than ever and a triple-lens rear camera, it excels in every area. The only reason you wouldn't want to get the S10 Plus is if you don't like large screens or if you're trying to stick to a budget. Otherwise, this is the best Samsung phone on the market in 2019... at least until the Samsung Galaxy Note 10 makes an appearance later in the year. 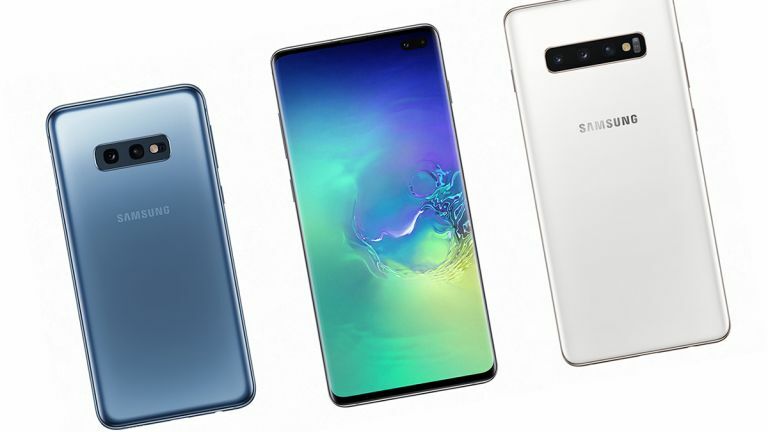 It can be tricky to choose between the three Galaxy S phones Samsung has launched in 2019, but we reckon the S10 just about edges it over the S10e. Sure, it's more expensive, but you get a bigger screen and a better camera for your money, so it's worth the outlay. In our time with the Samsung Galaxy S10 we've been impressed by just about everything the phone has to offer: blazing fast speeds, a gorgeous-looking 6.1-inch screen with minimal bezels, the triple-lens rear camera, and more. You can't go wrong with this. The Samsung Galaxy S10e sits below the S10 Plus and the standard S10 in our rankings, but it's still a very appealing package. For less money than the top two phones, you still get the same snappy top-end processor inside and the same slick software on board as well. The dual-lens rear camera isn't quite as good and of course the 5.8-inch screen is smaller – but you might well see that as a positive not a negative. If you've got smaller pockets or hands, or you want to save some money on your upgrade, the S10e is well worth a look. The Samsung Galaxy Note 9 is packed with mouth-watering specs and features a simply gorgeous 6.4-inch screen, and so if money is no object and you want a stylus then it might well be the best Samsung phone on the market today. The specs (including the camera) aren't too much of a jump over the S9 and S9 Plus phones, so you're really paying for the screen and that S Pen. The stylus gets an upgrade with the Note 9, including remote camera shutter and media playback capabilities. Our pick for the best Samsung phone of 2018 was the Samsung Galaxy S9 Plus, with all of the upgrades it brought: to the processor, to the camera, to the on-board OS, to the storage options, and so on. Unlike the regular S9, you get a dual-lens rear camera too. It may now have been eclipsed by the S10 Plus, but this is still a fantastic phone, and you can now find some fantastic deals on it too. If you don't like the Infinity-O hole punch notch that the new Galaxy phones are sporting, perhaps the S9 Plus might suit you better. If you're in the market for a smaller, compact screen at a lower price, then the Samsung Galaxy S9 has you covered, with its top performance and fantastic camera (though it sticks with a single lens). This was top tech in 2018 and can still hold its own in 2019 too. It's a faster, better designed option than the Galaxy S8 that came before it too, with the rear fingerprint sensor in a place that actually makes sense, and improved specs all round. This phone will still take everything you can throw at it, and look good while it's doing it too. If you want the biggest screen possible on a Samsung phone, and a stylus, and want to save some money, the Galaxy Note 8 might be the device to go for. The 18.5:9 Note 8 display manages a huge 6.3 inches, corner to corner. Of course you get top of the line specs too, or at least top of the line for 2017. With the Note 9 now on sale and the Note 10 around the corner you might be able to find some decent deals for the Note 8, and it's still going to last you for a long time. Welcome to the... er... fold then, to the Samsung Galaxy Fold – the innovative bendable beast can be yours if you want a piece of the foldable phone action. The phone will certainly impress anyone you show it to, but it'll also set you back £1,799 / $1,980 and up. You do get a lot of fantastic hardware for your money – a triple-lens rear camera and a dual-lens front camera, the best specs money can buy in 2019, and a screen that opens out into a tablet and folds down into a phone. An amazing bit of tech, if you can afford it. The Samsung Galaxy A9 is Samsung's newest – and therefore probably best – mid-range phone, fitting no fewer than four cameras on the back. It's a bit gimmicky, but it should up your Instagram game by several levels. The 6.3-inch screen is generous and adds to the phone's appeal, and you can get either 6GB or 8GB of RAM as well. The Snapdragon 660 CPU is mid-range, but the price drops accordingly, so it's a good deal. Just make sure it fits in your pocket. You can think of the A8 phones as scaled down versions of the S8 handsets, though they're newer – we'd certainly suggest checking these phones out if you want something that looks good, works well, but won't break the bank like the top-end Samsung phones will. Again, we always give preference to the larger phone in a Samsung pair, though it really depends on your personal preference as well as your budget. The A8 Plus offers a 6-inch screen, an Exynos 7885 chipset, a choice of 4GB or 6GB of RAM, and a 16MP rear camera. And then there's the smaller Samsung Galaxy A8, which gives you just about everything you get with the Galaxy A8 Plus but with a smaller 5.6-inch screen. Like its bigger sibling, the phone is waterproof, though you only get the 4GB of RAM option with this handset. Again the single-lens 16MP rear camera is here to take care of all your photo-snapping needs, but this being Samsung, you know it's going to be capable of some pretty impressive results. It's available with 32GB or 64GB of storage, with microSD expansion. Let's not forget that Samsung makes some very good mid-range phones too, besides its top-of-the-range flagships, and the A5 is currently one of the best value ones you can get your hands on direct from Samsung – not everyone needs the very best specs in a phone. The 5.2-inch Galaxy A5 brings with it an Exynos 7880 chipset, 3GB of RAM, and either 32GB or 64GB of storage (which can be expanded via microSD). Its design is simple but stylish, and there's a choice of colours, as well as a competent 16MP camera around the back.